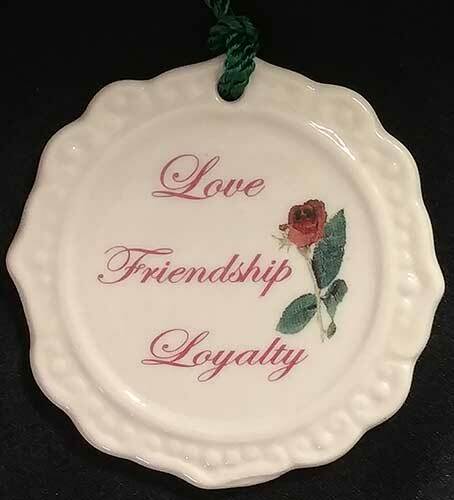 This Belleek ornament was introduced in 2010 and features the words: Love, Friendship, Loyalty. The Belleek ornament features a double sided design that features an embossed Claddagh along with a rose and verse on the opposite side. 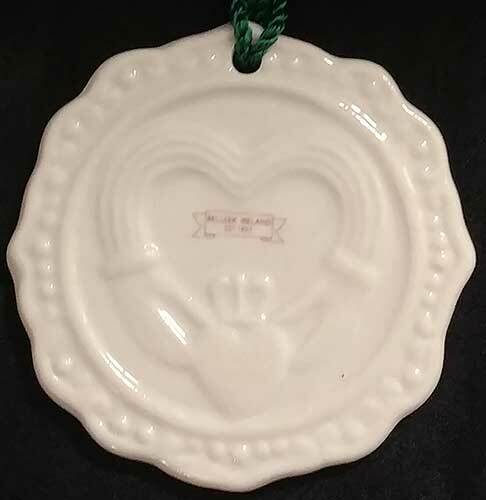 The Belleek Claddagh ornament measures 2 3/4" diameter; it is ready to hang with the included green cord. The Belleek Christmas ornament is crafted of fine china. This Irish Christmas ornament is handmade in Belleek, Ireland and it is gift boxed with a Claddagh history card, complements of The Irish Gift House. Belleek hope plate ornament with shamrocks is the second in the series. Belleek peace plate ornament with shamrocks is the third in the series.